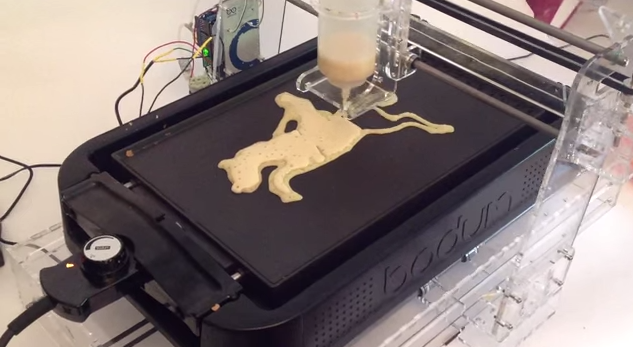 In the near future, you might be able to wake up, throw some pancake batter into a machine, and sit down ten minutes later to some Eiffel Tower-shaped pancakes. Or pancakes resembling your face. Or anything, really. PancakeBot, a 3D-printer that allows you to transform images into pancake form, is the brainchild of Norway-based designer Miguel Valenzuela. Currently, it’s still in prototype form, with Valenzuela recently launching a Kickstarter in the hopes of crowdfunding his project. According to the description on Kickstarter, PancakeBot will allow you to design your pancakes by tracing an image — any image — on your computer. After that’s done, all you need to do is load your design into the bot via SD card — the bot’s software will do the rest. There’s a lot of inventiveness to be had, from adding food colouring to the batter to produce coloured designs, to shading the pancake by planning out the order of the lines you trace — the first lines you trace will be cooked longer and so will turn out darker. According to an interview with Fast Company, the inspiration for PancakeBot came about — and you might have guessed this — from Valenzuela’s three-year-old daughter. As of now, Valenzuela’s Kickstarter project has already raised around $95, 000, nearly double of his intended goal of $50, 000. If you’d like an extra something to make you look forward to breakfast every morning, you can get one for $179, or approximately S$247.